Wrapping presents can be as enjoyable as opening them. Plan ahead, choose your materials carefully. This will help you make a well-organized gift wrapping project. 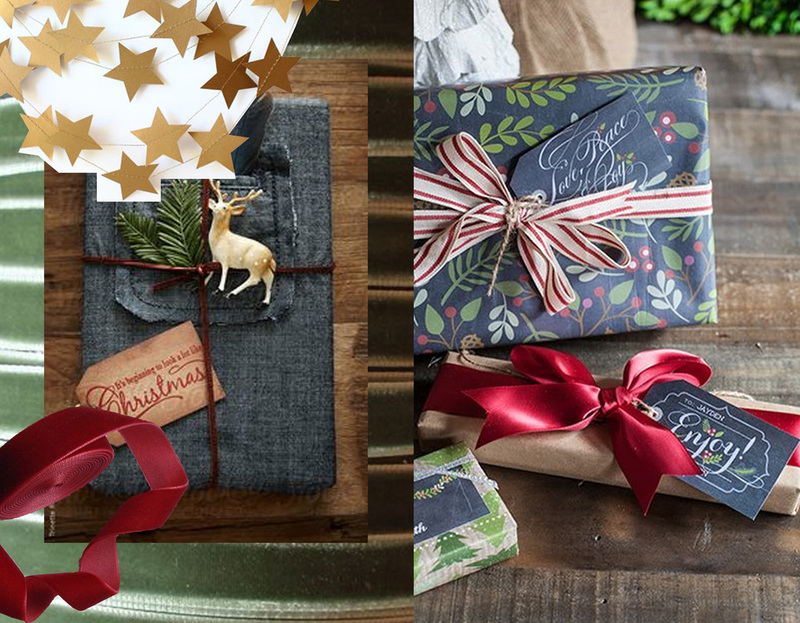 Some gift wrap tips and inspiration will help you to make the outside of your present as special as the gift inside. We have been looking, two weeks ago, at some ideas to decorate our home without cutting a tree. Can you imagine how much ton of wrapping paper is thrown away during the Christmas holidays? Lets think of some alternatives. 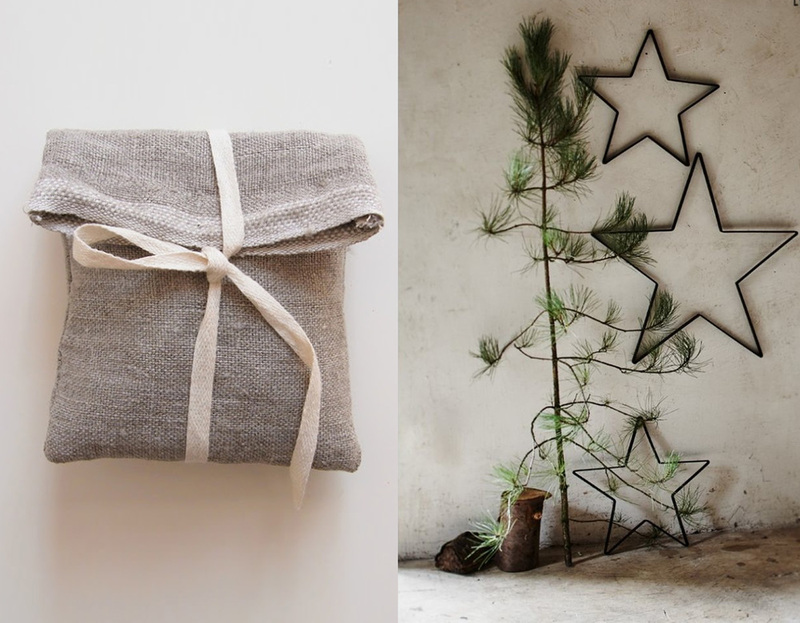 Maybe you have some nice linen fabric, perfect to make a hand-stitched envelop, made in the size to fit your present. They can be used over and over, as sachets or as a small cases for travel toiletries. There are so many beautiful wrapping papers available but I just love simplicity: white paper, kraft paper and than add some well chosen decorative details to make it look fancier. Some branches which you've cut in the garden, herbs you have in the kitchen, a flower, they make wonderful accents. Or make it personal with a family picture. Basic materials are the perfect base for creative wrapping, they are unpretentious and will give you all the freedom you need to make it a personalised gift. Still looking for that perfect paper? Think out of the box: use pages out of an old book to wrap small gifts, or an old map, they make a great wrapping paper. Stitch small pages together with a red yarn. Take a look at your local newsstand: add an unusual twist by wrapping your present using a foreign-language newspaper, this will be an absolute beautiful gift. When I think of a traditional Christmas, than I think of red and green. I think of warm fabrics, the sent of cinnamon, open-fire place, Christmas carols, hot chocolat. We can use red kraft paper if the classical brown one is maybe to simple for you. Add jacquard woven ribbon, or a nice velvet one. A touch of green and you have your traditional Christmas feeling. You can find amazing beautiful wrapping papers, with a design fitting the holiday season, they make your gift extra special. Isn't it a pity to thrown them just away? Unwrap your gift with care to allow the paper to be reused. Cloth gift sacks can be easily reused many times: both of these concepts are part of the Green Gifting trend that encourages recycling. Choose a theme for your gifts, it can be a colour harmony in which you mix-and-match different designed wrapping papers. It will unify the look of your gifts. 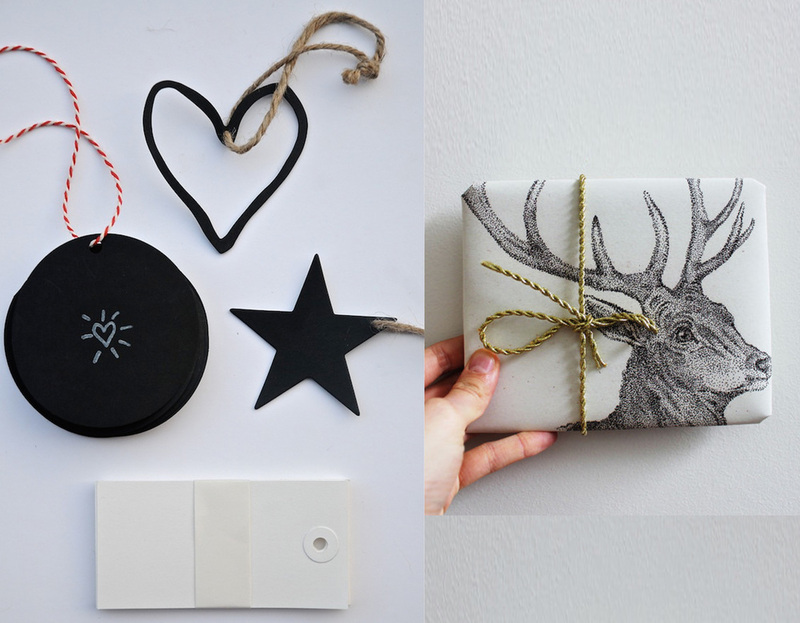 Black-and-white: a modern approach for the Christmas wrapping. Take another look on my blog where I got inspired on Maramures for the Christmas decoration, if black-and-white would be to modern for you. Their traditional costumes are in black and natural wool, all combined with beautiful and colourful embroideries. Add some colourful touches on your gifts. In Western culture, gifts are often wrapped in wrapping paper and accompanied by a gift note. In Chinese culture, red wrapping connotes luck. In Japanese culture, wrapping paper and boxes are common. However, the traditional cloth wrapping called furoshiki is brilliantly ecofriendly, and very practical. I hope you got inspired, have fun wrapping your gifts.